Anyone who follows this blog knows that I’m from New England and have a particular interest in the history of the 26th Division given it’s designation as the New England “Yankee” Division. I’ve had this photo for a few years and recently decided to reexamine it to hopefully find some extra info on the veteran. Low and behold I was able to discover a treasure trove of info on his service during WWI. A particularly fine pose showing the two wound chevrons and the OS stripes, this shot is one of my favorites from the 26th Division. 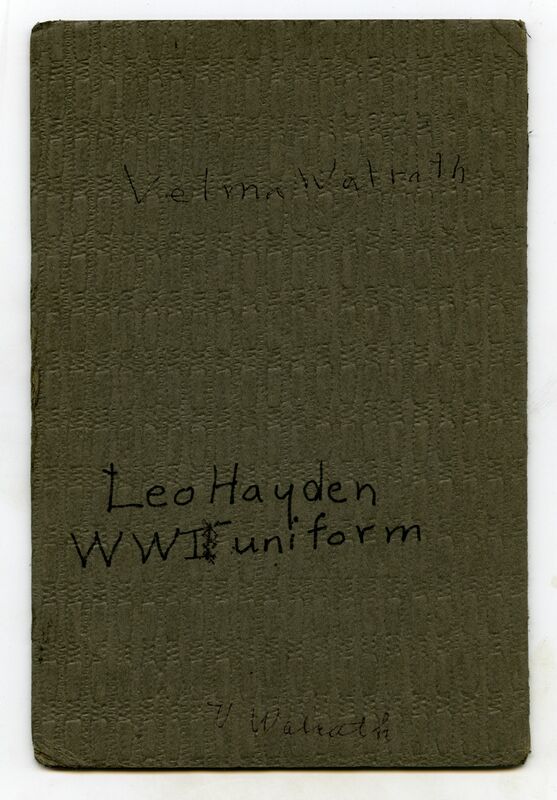 Leo Hayden was a member of Company L of the 101st Infantry Regiment of the 26th Division. He is buried in St. Patrick’s Cemetery in Natick, MA. 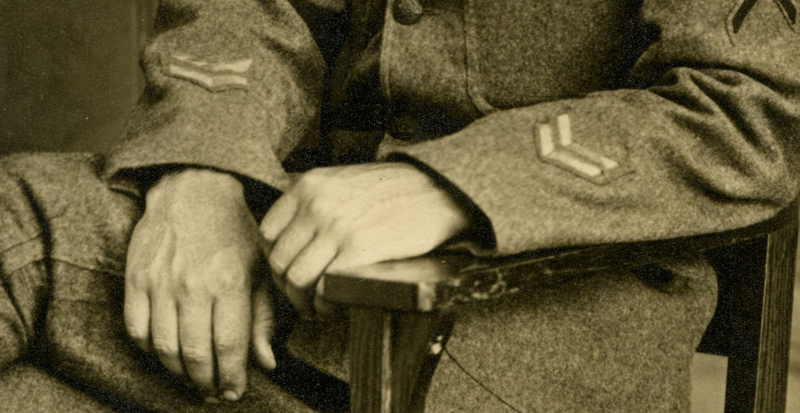 One mysterious point about the image is the fact that he is wearing a 104th Infantry Regiment collar disc but is listed as being a 1st Sgt. with the 101st Infantry. Is it possible that he was moved to the 104th prior to shipping stateside? recently found a daily account of the sanitary train in france,anyone interested? Thank you for posting this photo of Mr Hayden. My Great Grandfather was Colonel Jeremiah J Healy Commanding Officer for company L of the 101st during WW1. He too was from Natick and is also buried at St. Patricks Cemetery. I have a number of letters my Great Grandfather wrote to my Great Grandmother during this time. I will have to check, but In one particular letter I believe he writes about Mr Haydon and the good deeds he and other men from Natick are accomplishing in France. Thanks for a great website! Thanks Mike – glad you like the site! I try my best to properly identify the photos in my collection, but I sometimes come up with tough nuts to crack. This one still has me double guessing myself, but I’m fairly certain it’s a positive ID. Would love to add a scan of your letter regarding Hayden to this post! Discovered you site while searching for info on ancestor Martin Henry Dailey. 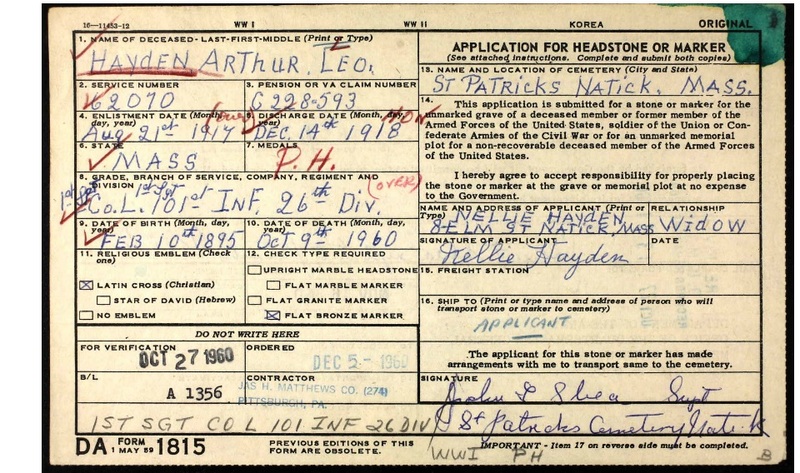 Per an application for headstone he is listed as being in Co. “L”, 101st Inf., 26th Div. He lived in Detroit at the time and Camp Custer is mentioned on the form. This was a training facility established in 1917 so he must have been a replacement as I see the 101st was from Mass. Conn. area. 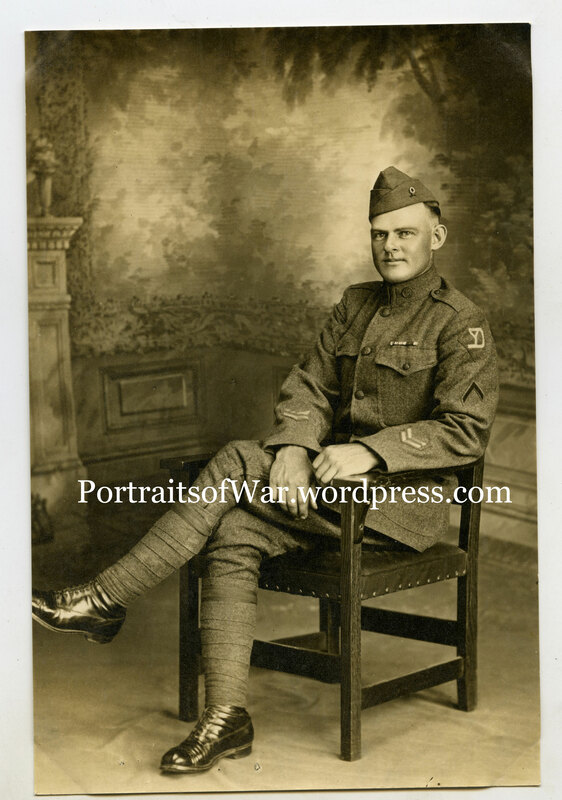 He Enlisted 5/28/1917 and was disc, 4/24/1919. This disc. appears to be before the Reg. returned in Sep. 1919. Not sure if he made it to France but he married a French girl later on. Any additional info on Company “L” would be welcome.